OUR FLOWER CSA OFFERS YOU THE VERY BEST OF WHAT'S IN BLOOM EACH WEEK ON OUR FARM. Our flower shares bring the ephemeral beauty of the seasons right into your home. Whether it is a gorgeous mixed bouquet or a bunch of perfect fall dahlias, flowers are sure to bring you joy on the daily. We truly believe that beauty is a wonderful form of nourishment in this crazy world, and we hope that our blooms will nourish you too, heart and soul. Five weeks of stunning spring blooms, mid-April to early May. NEW! We are so excited to offer this share in 2019! 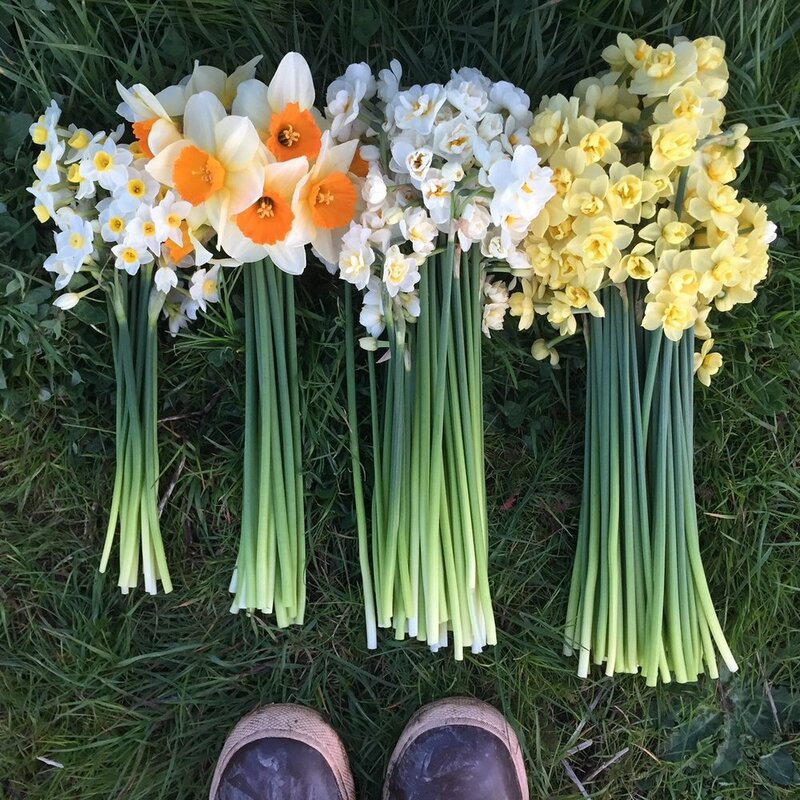 The spring flower share celebrates the incredible beauty of ephemeral spring blooms, featuring fragrant narcissus and hyacinths, lush tulips, cheerful anemones, and ruffly ranunculus. Welcome the season of growth and light right into your home. Eight weeks of gorgeous, unique mixed bouquets designed by Farmer Beth, July & August. A longtime customer favorite, this share features the absolute best of the summer flower patch, including blooms like sunflowers, snapdragons, lilies, zinnias, marigolds, asters, and so much more. Unique color combinations, textures, and scents abound. Celebrate the light and heat of summer with weekly bouquets, arranged with love. 5 weeks of beautiful dahlia blooms, early September to mid October. Dahlias are simply one of the most stunning flowers out there. Coming in an incredible range of colors, shapes, and sizes, dahlias are sure to delight! We grow more than 40 varieties of dahlias, meaning week to week you will see a an incredible range of blooms. Summer Bouquet Share: Projected start date is July 9th. Pick up will run for 8 weeks. Fall Dahlia Share: Projected start date is September 10th. Pick up will run for 5 weeks.